According to a report by the India Brand Equity Foundation, the information technology (IT)-business process management (BPM) sector in India expanded at a compound annual growth rate (CAGR) of 11.14% to reach $154 billion in fiscal year 2017 (FY17) from $74 billion in FY10. It is estimated that the size of the industry will grow to $350 billion by 2025. Total exports by the IT-BPM sector (including hardware) were estimated to be $117 billion in FY17; exports rose at a CAGR of 12.84% between FY10 and FY17. Exports of IT services were the major contributor, accounting for 56.41% of total IT exports in FY17. 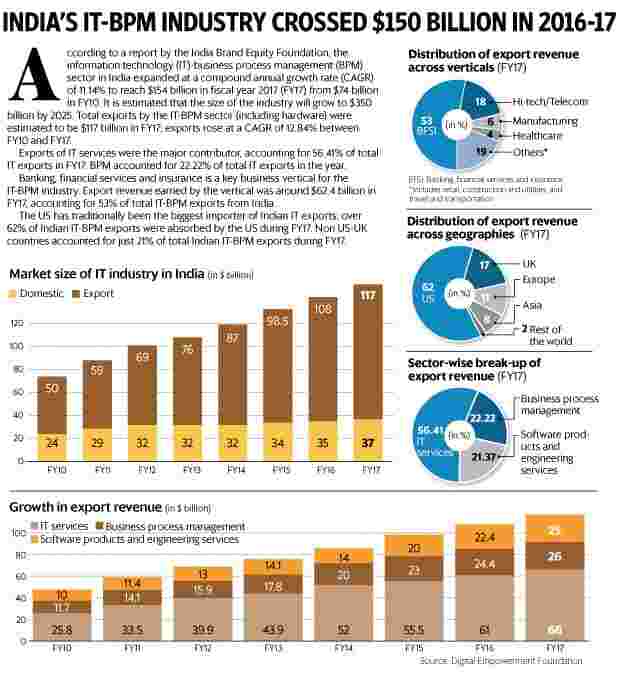 BPM accounted for 22.22% of total IT exports in the year. Banking, financial services and insurance is a key business vertical for the IT-BPM industry. Export revenue earned by the vertical was around $62.4 billion in FY17, accounting for 53% of total IT-BPM exports from India. The US has traditionally been the biggest importer of Indian IT exports; over 62% of Indian IT-BPM exports were absorbed by the US during FY17. Non US-UK countries accounted for just 21% of total Indian IT-BPM exports during FY17.